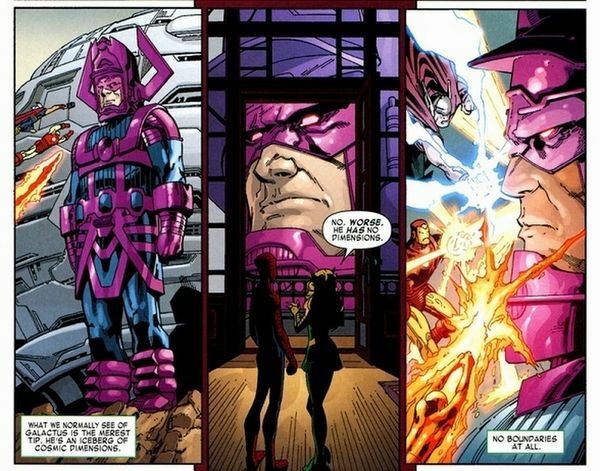 Enchantress wrote: What we normally see of Galactus is the merest tip. He's an iceberg of cosmic dimensions. No worse. He has no dimensions. No boundaries at all. Hey Beyonder how's things? I've argued Galactus omniversal ability in other forums. He's way more powerful than Marvel writes him. I'll post on it maybe later. @Jabosha wrote: Hey Beyonder how's things? I've argued Galactus omniversal ability in other forums. He's way more powerful than Marvel writes him. I'll post on it maybe later. It's good the site is growing well and I mostly consider Galactus a Multiverse to likely a Multiverse+ destroyer especially when he has the Ultimate Nullifier but Marvel never want's show his power smh. Beyonder, a thought just occurred to me while relooking at this panel. This goes for any universal buster or higher. Why do comic writers have exponentially inferior beings attacking these entities? Put into perspective, it's like attacking a universes energy itself. If a being can destroy a universe from it's own internal energy, then that being has energy universal or higher. It doesn't make sense to even bother. It is what it is. Spiderman can fight the Hulk or Thor and there's a slim chance, very slim, he could win by any method, from outright winning to getting them to see reason. That's not culpible in a fight with a uni/multi/omniversal entity. In the Galactus engine arc, Silver Surfer said the true nature of the combat between the entities was imperceptible to the humanoids at the fault line. If you can't perceive the combat, you can't fight. This is the reality. Look I understand the need to go against the odds, I get it. That's not what is happening. It's basically attacking a contained universal energy or higher to which there are no odds. What are the odds a human can move a galaxy with mental thought in real life? Those are the odds. You'd think this would sink in when writing cosmic stories. To me, it's tiring seeing Thor, Ironman and others attack such powers. These entities know what it's like to be human, make no mistake. They know why we are the way we are. Any thing else is writing for self aggrandizement. I'm not saying they know everything but if an entity understands many complex univ/multi/omniversal concepts and it's heirachy and why it exists, which would include all intelligent species within, certainly they understand something less complex as being human. Remember, I'm coming from entity perspective through experience of the entity not a human one. 1. I know it's all for a interesting story I mean look at the Secret wars (1980s),Secret Wars (2016), and Ultimates.....they just don't know anymore. 2. I agree in a one shot mini-event with Galactus in an Alt Universe was going rogue and taking over why did Reed Richards make a damn weapon that destroyed TLT and other cosmic beings like Shaper of Worlds? Like what kinda logic?! It was stated it was a Solar system endangering weapon so wtf?! oh I`m glad I came across this thread,i truly think that us as fans of these cosmic beings know more about them than most of the guys that write them do.i wish there was some guide of basic scale of guidelines these writers have to check and adhere to.A perfect example would be Odin vs. Seth,i know Odin has vast power with his odin force(a combo of himself and brothers vili and ve)so he could technically be considered a 3 in one skyfather.Seth at the time I think managed to aquire all the power of his patheon,but them destroying galaxies and endangering the multiverse as a side effect of their battle.i mean come on defalco must have been hitting the crack pipe when he wrote this.I think odin(and i have no bias here as he is one of my 5 fav cosmics)could using all his power at once destroy 2 or 3 solar systems,even surtur said he thought Odin`s power was beyond belief.i mean lets face it if skyfathers where that powerful there must be thousands if not millions of them in the universe,a being like galactus the stranger ect. wouldn`t be billions of years old they would have met their match a long time ago. Tom Deflaco was a huge failure in marvel if we are being honest here he retconned Beyonder and then made a story using the character he hated???? like come on! the whole galaxies and then being a threat to the multiverse was the biggest hyperbole I have ever seen. MR.B or anyone else who might remember,was it Deflaco,jim shooter or whoever was editor in chief at the time that hated the beyonder and ordered him depowered.Steve Engleheart even stated that he gave the beyonder as much dignity as he could while he was ordered to depower him to cube levels.this caused a chain reaction through many titles that screwed things up for a long time.i`m still not even sure of his true origin anymore though he is still able to destroy universes with ease. Yeah Beyonder is still a Cosmic Cube as we speak and yeah Tom Deflaco is just overall a douchebag for what he did. I thought he was now he was now a mutant who was also exposed to the terigen mist that all the inhumans where exposed to,I don`t know but he`s still a universe buster.Look and see what happened when spiderman had his power less than a second,he beat galactus all the heroes of earth and probably most of the cosmics in the universe(just going by memory here). Nah that was all a troll by beyonder it was confirmed in his official handbook that he fooled professor xavier and the illuminati into make him think he was a inhuman mutant hybrid. And that spiderman with his power is from what I remember a what if story or something along that lines since ite foreshadow doom losing anf etc.